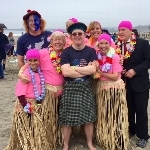 We will be jumping into the Pacific Saturday, March 23 to support the special olympic athletes in northern California. We love doing the plunge. The special athletes come and participate in the event as well. They are so excited to be there and recite the special olympics pledge with such vigor. The special olympics provides many opportunities for them to play and have fun with friends. Playing and having fun with friends is at the top of my list and yours, too, I would imagine. If you prefer not to donate online, please find a donation form below. If you would like to join us in the plunge, we would love to have you. As you can imagine, we do manage to find quite a bit of fun doing this. The plunge is March 23 in Rio del Mar. A note from the Special Olympics Organization: Join us on March 23, 2019 as we “Plunge with a Purpose”- to encourage inclusion through sports and change the way that people think about and treat individuals with intellectual disabilities. Funds raised from the Sacramento Polar Plunge help us continue to generate change in our communities and enhance the lives of our athletes and their families.